Wildlife Biologist Matt Robus is the director of the Division of Wildlife Conservation at the Alaska Department of Fish and Game. In recent months the press has been crowded with news and speculation about the spread of a highly virulent form of avian influenza within Asia and more recently into Eurasia and Africa. The Asian H5N1 bird flu is an increasingly important international issue among agricultural, human health, and wildlife agencies. This disease has been highly pathogenic (lethal) in domestic poultry and some species of wild birds, and has caused a high mortality rate in the few humans who have caught it. But amid the hype and speculation about “bird flu” it is important that people have a basic understanding of the disease, and the efforts underway to detect it should it arrive in Alaska. There are many avian flu viruses (there are 144 types and even more subtypes) and they are common in wild birds, particularly waterfowl. Generally, these viruses do not cause significant illness to their hosts. However, through a combination of genetic changes, occasionally a form of avian flu can appear which is highly pathogenic to domestic poultry. The Asian H5N1 subtype of avian flu virus is just such a form and has developed in domestic poultry in Southeast Asia within the last few years. The Asian H5N1 Highly Pathogenic Avian Influenza (hereafter HPAI) has devastated poultry flocks and spread rapidly through transportation of birds and movement of people between flocks. In some areas, infected domestic flocks have re-transmitted the disease to wild birds, with devastating effects to some wild species. HPAI has been transmitted to a small number of people in close contact with infected domestic birds, making them very sick and causing death in a high proportion of exposed people who show symptoms. HPAI is primarily a bird disease and does not easily infect people, and there are no documented cases of human infection from wild birds. However, the potential for this virus to acquire the ability to be transmitted to and between people has raised concern that it may lead to a new human influenza pandemic, and governments around the world are working to track and prevent spread of the disease. Since the new virus subtype can infect wild birds, there is some potential, although unknown, for wild birds to carry the disease to new areas. To date, the virus seems to have spread primarily through the movement of poultry and poultry products. It is important to understand that wild birds are primarily victims of HPAI, not necessarily the cause of its rapid spread; in fact, there are other, more likely, potential vectors for the virus. Even so, we must deal with the possibility that wild birds may bring HPAI to this continent. To address that, the Department of Homeland Security convened a national agency workgroup last summer to plan a surveillance system for the early detection of H5N1 HPAI, should it arrive in North America via wild migratory birds. Given Alaska’s geographical position at the intersection of several Asian and North American flyways, our state was the only one added to the federal work group. Both human health and wildlife agencies at the federal and state levels are involved in preparations for HPAI. The Alaska Department of Fish and Game’s role has been to help plan for the sampling of wild birds in Alaska to allow the early detection of the HPAI virus if it is present. Based on different species’ susceptibility to avian influenza viruses, interagency teams have worked out which wild bird populations will be sampled and have divided up the sampling effort in order to make the program as effective as possible. Special congressional funding to the federal Departments of Agriculture and Interior will allow federal and state biologists to implement sampling strategies developed by the national workgroup, including the sampling of live wild birds, hunter-killed birds, and the analysis of any sick or dead birds that are detected. Our efforts to organize sampling here in Alaska have enabled us to advise flyway states in the Lower 48, in recognition that if HPAI occurs in wild birds here it could be carried southward during fall migrations. As we take these precautionary measures it is important to remember that there is no reason to think that HPAI has reached Alaska, and that it is not certain that it will be brought here by wild birds. In addition, we know of no case where a person has become infected with HPAI from a wild bird. Our best advice is that Alaskan hunters should not be overly concerned about avian flu, but should practice common sense precautions while handling and preparing wild birds. Do not use any birds that are obviously sick, wash up after handling birds and clean your tools and work surfaces, use rubber gloves while dressing birds, and cook the meat thoroughly to kill disease and parasite organisms—all practices that should be used whether or not HPAI makes an appearance here. Just as important as the surveillance effort now gearing up is outreach to Alaskan communities to keep hunters, birders and others who encounter wild birds informed on avian flu issues. This too is a part of the interagency efforts, and more information will be forthcoming as the HPAI surveillance program proceeds. Obviously, we must recognize the potential danger posed by this new disease to birds and take reasonable steps to prepare for its arrival. In addition, health and wildlife agencies will need to watch closely to determine whether Asian H5N1 HPAI will become a major human health threat. However, it is just as important to be level-headed about the situation; Alaska’s wild birds are a fantastic treasure and should not be regarded as a culprit. If wild migratory birds are unfortunate enough to bring HPAI to Alaska, the planned surveillance efforts will help ensure that we are not caught by surprise. Certified Wildlife Biologist Matt Robus is the director of the Division of Wildlife Conservation at the Alaska Department of Fish and Game. He is an enthusiastic waterfowl hunter, decoy carver, and birder. 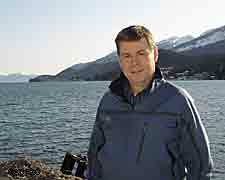 Among other duties, Robus represents Alaska on the Pacific Flyway Council and the International Sea Duck Joint Venture.